$35.00 In stock. Order in the next 3 hours, 28 minutes and it will go out today! 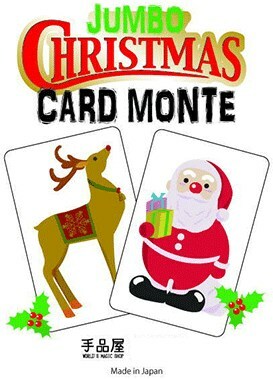 The magician shows two jumbo sized cards, one with Rudolph the Reindeer the other with Santa. The magician hides Rudolph behind his back and asks the audience "Where's Santa?" The audience replies "Santa's in your other hand!" But to their surprise, the magician brings the card out from behind his back to show that Santa was hiding there the whole time. Repeating the game again with the same results, the magician then hides Santa behind his back asking "Where's Santa?" The audience exclaims "Behind your back!" Only this time Rudolph was hiding there instead! Setting the Santa card down the magician ends with wishing the entire audience a "MERRY CHRISTMAS!" and opens the remaining Rudolph card to reveal both Santa and Rudolph together!